Stark County Farm Bureau is 1 of 95 County Farm Bureaus in the state of Illinois that comprise the Illinois Farm Bureau. 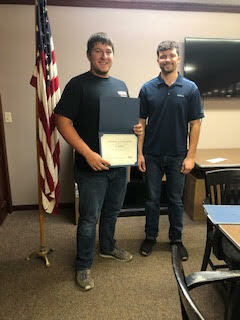 We are a not for profit corporation that has been speaking up for agriculture more than 90 years with committees such as Ag in the Classroom, Marketing, Membership, Legislative, Local Affairs, Primetimers, and Young Farmers. Our goal is to fulfill the mission of the Illinois Farm Bureau to, "Improve the economic well-being of agriculture and enrich the quality of farm family life." We offer local and statewide benefits, we serve as a voice for the agriculture industry, and we develop educational and social events for our members. 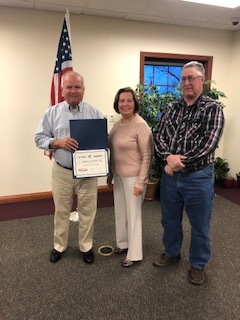 At the Board Appreciation dinner in February, the board recognized Jamie Schaffer (pictured) for his 19 years of dedication to the Farm Bureau Board. Also recognized were Lee Hager for 19 years on the board, Doug Murray with 12 years, Wayne Dienst had 10 years and our retiring secretary Karen Cobb for her devoted years to Stark County Farm Bureau. 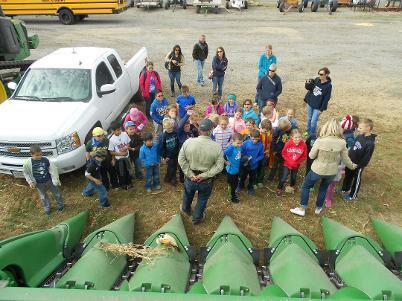 Click Here to register for this year's Ag in a Day Summer Ag institute. The cost is $10 a day and CPDUs are available. Congratulations to this year's 50 year members! Established in October of 1919 by 585 farmers, Stark County Farm Bureau has had an exciting and bountiful past. The founding members believed in the mission of Farm Bureau and believed that the organization could provide invaluable programs and services to not only the members of the Stark County Farm Bureau, but also to the communities of Stark County. Today, located in Toulon, IL where we have been since December of 1967, we continue the legacy of our founding fathers through our programs, committees, and volunteers.